Brands are always testing new ways to get their messages in-front of their desired audience. As they are constantly rethinking their strategies, the context seems favorable to experiment with new advertising models. With evolving data and algorithms, the breadth of ad formats available through programmatic trading is improving; more mobile and video formats are coming online all the time. The automation of processes combined with a consistent, user-friendly multichannel strategy are some of the key challenges of programmatic advertising for advertisers. 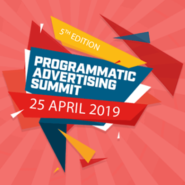 Join us to grasp all the ins and outs of programmatic activity at the Programmatic Advertising Summit on April 25 at The Hotel. A great opportunity to gain insightful analyses of this theme thanks to the conferences of several experts. Confirmed speakers include Clara Geerts of Google Marketing Platform, Catherine Hubaut of Gamned, Regis Watrisse of Mediascale, and Benjamin Sekkai of Appnexus.